Champions-elect Manchester City host champions Chelsea in the Premier League on Sunday afternoon. Could the Blues upset the Citizens at Etihad? 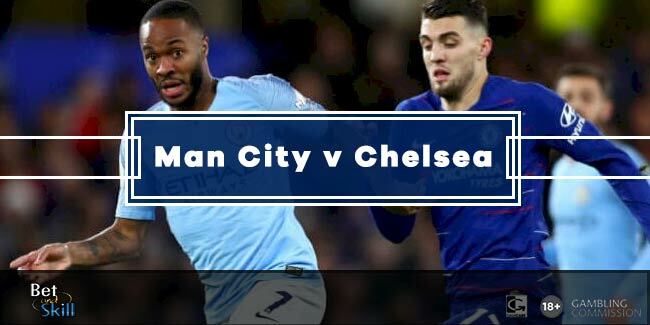 Check out here our Man City vs Chelsea betting preview with predictions, free tips, starting lineups, team news, highest odds, bookie offers and no deposit free bets on the Super Sunday games! Get 25/1 Man City to win vs Chelsea! New Customers can get Man City at an enhanced 25/1 to beat Chelsea . Max Stake £1. Winnings paid in free bets, valid for 7 days, only deposits with cards/Paypal count. Exchange and multiple bets excluded. T&C’s Apply. 18+|Gamble Aware. Manchester City only need a maximum of five more wins to mathematically win the Premier League title. The Citizens are 16 points clear of the Premier League after Thursday's 3-0 win away to Arsenal. After a shocking exit in FA Cup at the hands of Wigan, they took a huge amount of pressure off themselves by winning the Carabao Cup last week. Furthermore, Man City have won 23 of their last 26 league matches and go into this game 22 points above Chelsea having finished 15 points behind them last season. They have won their last 13 Premier League home games, netting at least twice each time. Kyle Walker will be assessed ahead of the kick-off after being forced off with a knock in the Arsenal match. Fernandinho missed Manchester City's game on Thursday through injury and remains a major doubt. Vincent Kompany has played all 180 minutes over the last two matches in all competitions, so either Aymeric Laporte or John Stones look set to partner Nicolas Otamendi in central defence. Raheem Sterling is back in training and could replace Bernardo Silva on the right of the front three, with Leroy Sanè on the other flank. Gabriel Jesus lacks match sharpness, so Sergio Aguero is expect to lead the front trio. Fabian Delph serves out his three-match suspension while Benjamin Mendy is still sidelined. Chelsea's league recent form is very poor te with defeats in three of their last four games - as many as they had in their previous 23 in the competition. Anyway, they were unfortunate to suffer a 2-1 defeat at Manchester United last Sunday, after producing the better chances. Antonio Conte's men has found the back of the net in the last 5 games in all competitions, but suffer the Premier League’s joint-sixth worst defensive record since the turn of the year. As to direct encounters, Pep Guardiola's men won 1-0 at Stamford Bridge back in September through Kevin De Bruyne’s strike. Anyway, the Blues won 3-1 on their last trip to the Etihad Stadium last season. Tiemoue Bakayoko, David Luiz and Ethan Ampadu have been ruled out for the trip to the Etihad but Ross Barkley has resumed training with the team and could play at some stage. Antonio Conte is expected to play with a more defensive 3-5-1-1 system, giving Eden Hazard the central striker role and benchin Alvaro Morata and Olivier Giroud once again. Willian is likely to start as number ten with Pedro as backup choice, while Cesc Fabregas should be recalled alongside Danny Drinkwater and N’Golo Kante in central midfield. Gary Cahill and Antonio Rudiger battle for a spot in the back three, while Victor Moses and Marcos Alonso will retain their starting berth as wing backs. Don't waste your time searching the highest prices available on this match. The following section contains the best odds on the Man City vs Chelsea match winner market! Don't miss our free football tips anymore! Follow us on Twitter!! 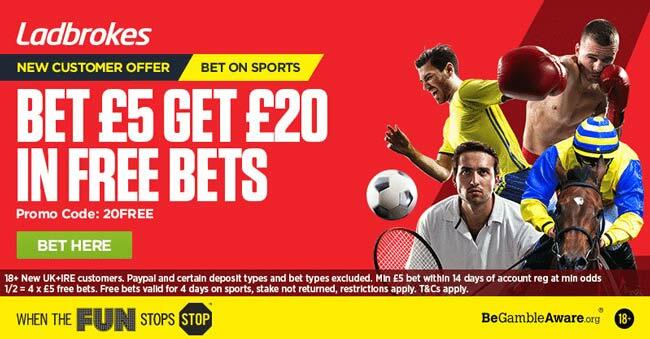 Coral offer 25/1 A corner to be awarded Manchester City vs Chelsea + £5 free bet! Read below our recommended bets on Manchester City vs Chelsea! Feel free to copy our betting tips and claim the best odds we have selected for you by clicking the 'Bet' button. Take also a look at our bookmakers' odds comparison table and today's price boost sections! Wanna read more Premier League free match previews? Take a look at our brand new Premier League betting tips section! "Man City vs Chelsea predictions, betting tips, lineups and odds (Premier League - 4.3.2018)"